Saturday, April 12, 2014: The Easter Bunny greets the crowd under a spectacular blue sky and the warmest Saturday in recent memory. Despite a very busy schedule of coloring eggs and making Easter baskets, the Easter Bunny made time to visit the children of Foxboro this past Saturday. 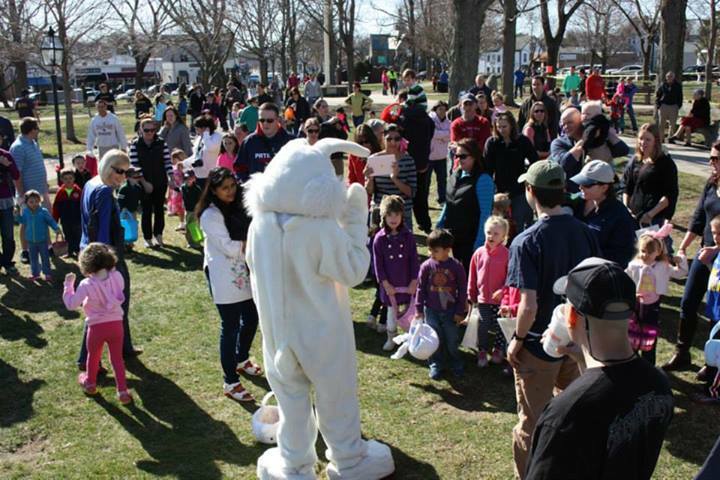 The Foxboro Jaycees once again brought the bunny to Foxboro Common in their annual spring Easter Egg Hunt, which included a meet and greet with the bunny. 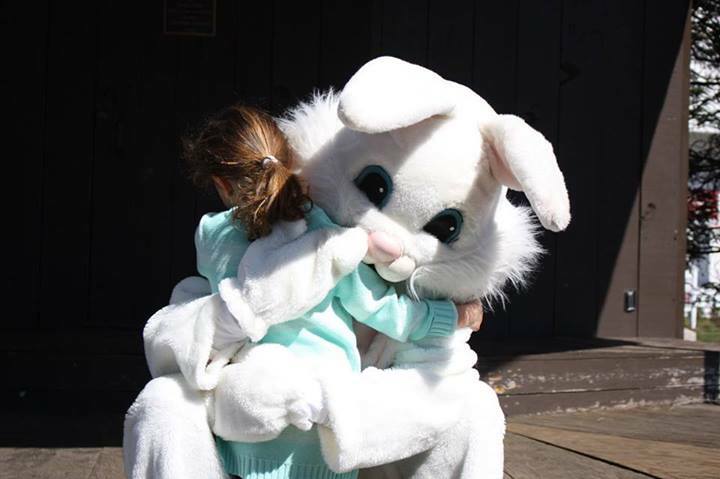 Under a spectacular blue sky and thankfully warm temperatures, the children collected candy-filled multi-colored eggs and then had their picture taken with their furry friend. All of this was free, an event that is by far one of the Foxboro Jaycees’ favorite community development projects. Chairmen Derek House, assisted by his wife Laureen and son Devlyn, reported that over two thousand (yes, two thousand) eggs were stuffed with candy and treats last week. Early Saturday morning, the Jaycee Blue Wave cordoned off three areas for different age groups, and then spread the eggs on the common. The Easter Bunny emerged from the bandstand at 9:30 sharp, to loud cheers. The bunny, accompanied by official bunny handler Kevin Hickey, made his way to the designated age areas to shake hands, give high-fives, supervise the hunts, and then posed for pictures. The Jaycees estimate the crowd at over 150. The Jaycees also provided free pictures to folks without cameras or those who wanted some extra images of their child with the bunny. Interestingly, Devlyn, who has been helping the Jaycees with many events since he was a little boy, and was busily working Saturday morning getting the eggs ready, vanished just before the arrival of the Easter Bunny, and mysteriously reappeared right afterward, saying he was sorry he missed the bunny. Derek and Laureen just smiled, noting he had an important appointment. For any children who might be reading this, we’ll leave it at that, but we will say that the Easter Bunny did a wonderful job and we were so happy to have him! The Foxboro Jaycees are grateful to the selectmen for allowing use of the Common, to the volunteers who helped, and especially to the people of Foxboro who attended the event. The Jaycees have been holding this event for well over 20 years, and we certainly hope to continue to do it for many years to come! When people ask me why I am in the Foxboro Jaycees, I like to show them pictures like this. My heart pretty much melted when I took this picture today. THIS is why I am in the Foxboro Jaycees. Foxboro Jaycees Concerts On The Common Offers Something for Everyone!